On October 19th, 2017, I stepped foot into Taylor Swift’s house in Westerly, Rhode Island. As a fan of over eight years, you could only imagine how exciting and life changing this experience was for me. 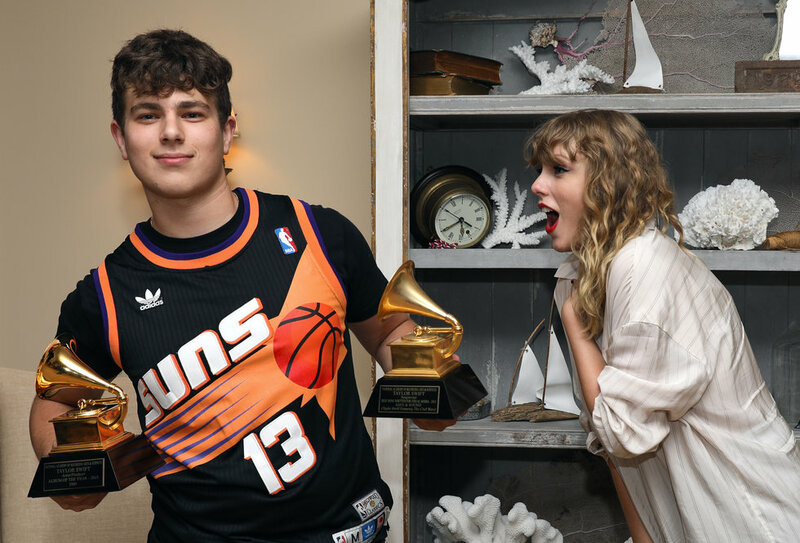 Taylor hand-picked me and around 60 other fans through social media to spend a day at her home and listen to her new album “Reputation” before it was released. We all met at an exclusive location near her home where we were escorted by drivers up the snake-like hill to her home. I had brought my boyfriend of over a year Andrew, who was completely out of his element surrounded by hyperventilating girls as we pulled up to her house. Once inside, we were all in utter shock, we were inside of Taylor’s house! She had a delicious layout of food, including customized sweets to snack on. While snacking, I strolled through her magnificent home, personalized with family photos and even a picture of her and Ed Sheeran holding their cats. First her father, Scott came out with plenty of "Reputation" guitar picks in hand, which I shyly asked for. Once I finished speaking to him, Andrew came over asking him to put on the NBA game. Soon enough a frazzled Scott was kindly trying to put on the game while we all laughed. Scott was so genuinely kind and smart, speaking with my boyfriend and me about college, sports and business. After speaking with Scott, Taylor’s mom, Andrea, also came downstairs to greet us. She was very warm and personable, reminiscing with us about their times on the Christmas tree farm. We also got to briefly speak to Austin, Taylor’s younger brother. After speaking with her family, we were brought into Taylor’s living room where we plopped down on pillows that covered the floor. In front of us was a large chair where we assumed Taylor would sit. The anticipation slowly killed us all, as we belted out the beginning of “Fearless”. Then Taylor walked out. She looked beautiful with her signature cascading curls and crimson red lipstick. Cheerfully, she spoke to us about the past few years and explained the meaning behind every song on her new album. She also streamed the first 30 seconds of the “Ready for It” music video, which was still in its beginning stages. Later, after we listened to the whole album, we scurried into her extended living room to read her newly exclusive magazines. Although the magazines were amazing, I was instantly drawn to her exquisite grand piano. Also, over there laid Taylor’s scrapbook from her 2013 4th of July party. Then to our surprise, Taylor made her way over to the piano. With pounding hearts, we all stood in awe as she started playing “All Too Well.” For me, this was my favorite song by Taylor. I could play it by heart on all six of my instruments, sung it for my 9th-grade art show, and even cried my eyes out when watching her perform it live at the 2014 Grammys. Now here I was standing right over Taylor as she played the masterpiece I could have only dreamt of her playing that night. Once she finished we were all in a puddle of tears. She then got up with her arms out wide exclaiming,” HEY Allie!” I thought I was going to faint. The only words that I could utter out were “I love you so much” before I went to hug her. Then as I went to introduce my boyfriend she shook her head explaining,” Oh I know all about you guys! I saw the video on your Instagram where you were like oh yeah I love him yeah I said it” she said sarcastically. Wow, she stalked my personal Instagram? Confused I asked, "Wait, that’s on my personal Instagram?” “Yeah,” she bashfully smirked as she went to speak to other exhilarated fans. I couldn’t believe it, not only did she know my name but she had stalked my personal social media! As we all lined up for photos with her, Scott explained to Andrew and I that he was upset no one used his beach chair props, so we promised him we would use them for our pictures. When first speaking to Taylor, I nervously rattled off my whole life story and how much she meant to me. Taylor was very attentive holding onto my every word. She even babbled on about how much she loved Andrew and me as a couple, recalling her favorite photos of us. Funny enough, talking to Taylor became easier as the time went on. High fiving over my accomplishments in school and our shared love for combat boots and thigh highs felt just so effortlessly easy. Then it was time to take photos. 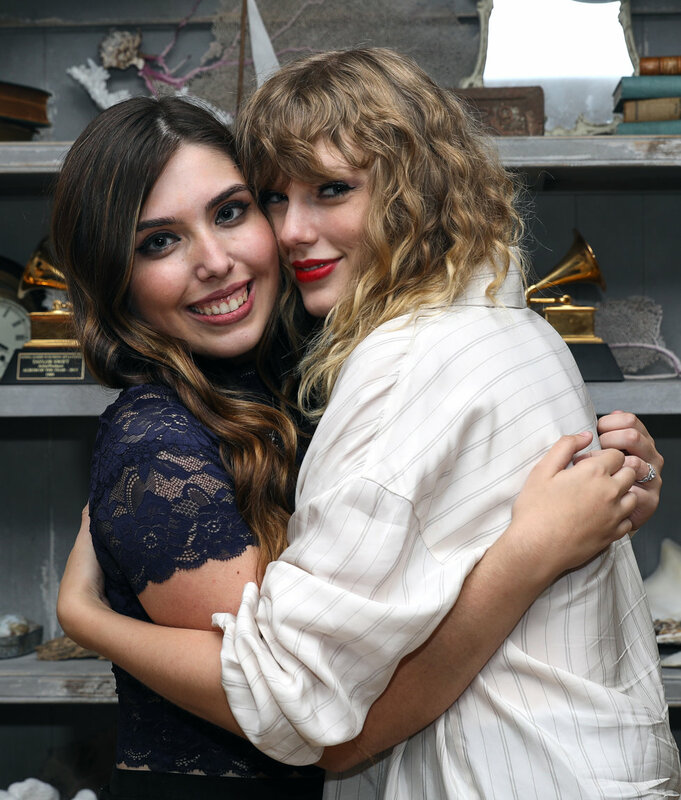 She held up two Grammys from her bookshelf casually, asking which one I wanted to hold for the pictures. I picked the 1989 Album of the Year Grammy, making sure to tell her how wonderful her acceptance speech was for it. We first sat down on the beach chairs posing like we were in a high-end music video. Then she and I did a cute hugging photo like we were best friends. Finally, she got to my boyfriend who is quite popular and outgoing. She got a bit nervous asking what his friends think is cool for poses, soon enough they settled on her fangirling over him. After hugging her goodbye and grabbing our REP bags on the way out her front door, it was time to go. Getting into the car and staring at her beautifully lit house that night, I knew I made the right decision to turn to her and her music all those years ago. As I had always said, Taylor was the big sister I never had. She forms such a bond with her fans and this experience was proof that Taylor is one of the most heartfelt and genuine artists of our time.